Spine 3.6.22-beta has a new feature: the Preview view. This allows you to play animations with mixing (crossfading) and tracks (layers), similar to the Skeleton Viewer. 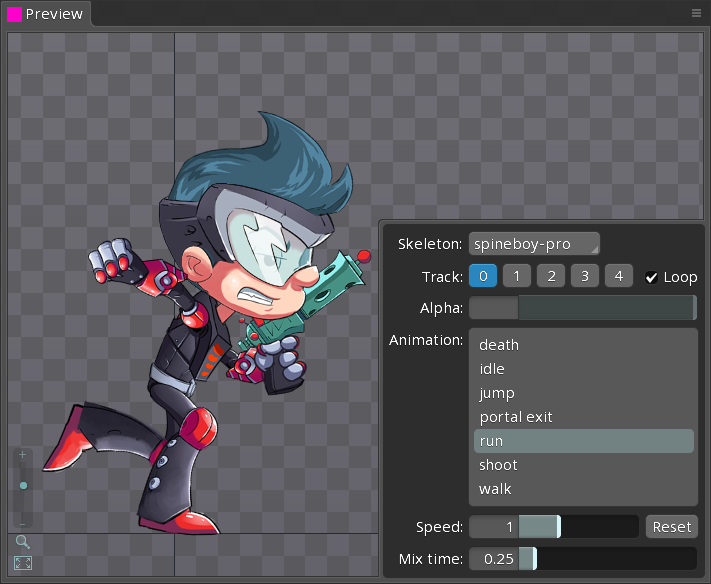 However, since you are previewing inside Spine, you can edit an animation while previewing it which is really, really neat! It's currently a work in progress and has some known issues that we are working on (such as images that aren't loaded), but we thought we might as well get it in the beta early, especially since it's so useful. We'll have more beta releases soon to fix it up, then 3.6 will be released as non-beta. We've already started on audio support for 3.7, which we intend to release in a much shorter time frame than 3.6.